Stamp Laugh Play : I'm Back!! I'm back!! My stitches are out and I'm going to do exercises at home to get back in shape. I won't be doing heavy lifting for a while but I can paint!!! I did these ATC before my surgery and now that I can type with two hands I want to enter them in the Craft Hoarders Anonymous Challenge. The green background paper is from a paper pack I've been saving. I buy pretty paper and then don't want to use it for fear it will all be gone. I'm forcing myself to stop thinking that way. It does no good sitting in a drawer. The orange paper is some I saved from the recycle bin. The characters & words are fabric from my co-workers stash of quilting fabric. A little detail trimming and some glitter glue and I've got some cute ATCs (Artist Trading Cards) for a swap I'm in with an online group called Tennessee Stampers. As a Mixed Media artist I really enjoy using different materials in my art. I've always liked using fabric in my projects... even before I knew what a Mixed Media Artist was. Do you use fabric in your projects? It is good that you are healing. Good to have to active!! 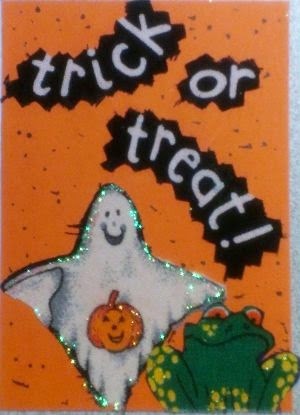 I just love both of these and the way you used the sparkle. Thanks for joining us at Craft Hoarders Anonymous! Thank you. I like to use a bit of sparkle from time to time. So cute and sparkly. Thanks for joining us at Craft Hoarders Anonymous! Love the glitter and the zig zag edges. Very cute! Prayers for a full recovering! Thanks for playing along with us at Craft Hoarders Anonymous! Very cute ATC! 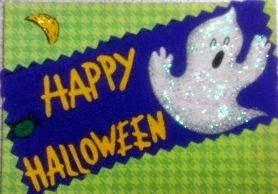 Love the glittered ghost. Thanks for joining us at CHACB. What an inspiring holiday project...it's fantastic! Thanks so much for playing along with us at Craft Hoarders Anonymous Challenge Blog! Thanks, I like this challenge.